The EPL-EMG-24-2L-LED-D-V2 from Larson Electronics is an Explosion Proof Dimmable Emergency LED Light Fixture is U.S./Canada UL Listed Class 1 Division 1 & 2, Class 2 Division 1 & 2, has a T6 temperature rating and is a superior lighting solution for areas where flammable chemical/petrochemical vapors or pulverized dust exist or have the potential to exist. This explosion proof failsafe light is 0-10V capable. 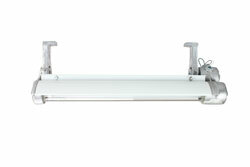 This 2 foot long, 2 lamp dimmable emergency LED explosion proof light fixture is ideal for use in locations requiring powerful yet compact hazardous location lighting that will improve overall illumination levels and light quality while reducing operating costs. The EPL-EMG-24-2L-LED is equipped with specially designed LED T-series bulbs which produce 15% more illumination at 8 feet distance as compared to standard T8 lamps when measured with an Extech light meter. Our LED-T series bulbs are visibly brighter than standard T8s and have consistently surprised many of our customers with their unexpectedly high light output levels. This 2 LED bulb explosion proof fixture is lighter in weight, has a slimmer profile, and produces more light than traditional explosion proof fluorescent fixtures. 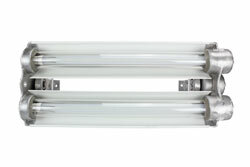 The 2 foot long T17 LED tube design bulbs included with this unit are rated at 50,000+ hours of service life, which is nearly twice as long as standard T8 bulbs. With an integrated emergency ballast, this explosion proof LED light will continue to illuminate one bulb at for 90 minutes at 1350 lumens once the main electrical power to the light is severed. Once standard electrical power is restored, the emergency battery pack will be recharged. This fixture carries a T6 temperature rating and is UL Listed Class 1 Division 1, Groups C and D, Class 1 Division 2, Group A,B,C and D, and Class II, Division 1 and 2, Groups E, F and G.
This emergency backup LED light works, mounts and is wired like our EPL-24-2L-LED explosion proof integrated LED light fixtures. 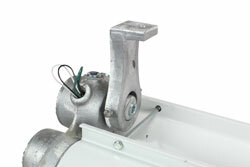 The main difference is that we add a battery backup unit that adds emergency light functionality to the fixture. With an integrated emergency ballast, this explosion proof LED light will continue to operate one LED lamp for 90 minutes at 1,750 lumens after the main electrical power to the light is severed. Once standard electrical power is restored, the emergency battery pack will be recharged. The battery backup unit includes a switched leg for turning the light fixture on/off without kicking the unit into emergency mode. 6. 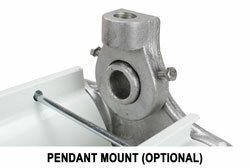 A wrench is used to unscrew the end caps for relamping the fixture, while some competitive models require the "tap and knock off" method to loosen the end cap. 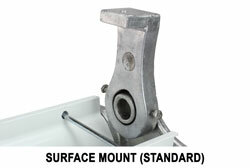 Click here for dimensional drawings for this explosion proof light.